Inductosense, a spin-out from the University of Bristol, has secured a funding round of £1.1m investment from a consortium of investors in August. The consortium consists of Perivoli Innovations, the University of Bristol Enterprise Fund (managed by Parkwalk Advisors Ltd), IP Group plc, the Institution of Mechanical Engineers’ Stephenson LP Fund, and a number of angel investors. Inductosense is developing novel ultrasonic sensors for monitoring corrosion, cracks or defects. The technology is known as the WAND – Wireless And Non Destructive system and it works by bringing a measurement probe near to a compact, battery-free sensor installed on a structure. What makes the technology unique is that the sensors are small, passive and wireless and can therefore be permanently attached to structures, even if the structures are beneath a layer of material or coating. The benefits to Inductosense’s customers are a significant reduction in cost and downtime associated with conventional monitoring. 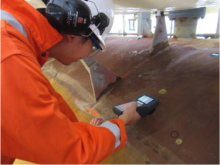 The technology was developed over several years by Dr. Chenghuan Zhong, Dr. Anthony Croxford and Prof. Paul Wilcox from the Ultrasonics and Non-Destructive Testing Group at the University of Bristol. In late 2015 the company was formed with funding from InnovateUK alongside angel investment. Since then the team have launched their first product (a system for measuring internal corrosion on pipework) and secured orders. They are working with a number of major companies on trials with an initial focus on monitoring assets across Oil&Gas and nuclear.